JS Tower is 900 metres from On Nut BTS Skytrain Station and Tesco Lotus Supermarket. It features a restaurant and a minimart. Rooms come with free Wi-Fi access. Situated on Sukhumvit Road, JS is a 35-minute drive from Suvarnabhumi International Airport. Fitted with tiled flooring and a seating area, air-conditioned rooms feature satellite TV and a fridge. Private bathrooms come with shower facilities and toiletries. Ruski Restaurant serves halal-certified Thai specialities. In-room dining is possible. Members of staff at the 24-hour front desk can assist with luggage storage, laundry and ironing services. Fitted with tiled flooring and a seating area, this air-conditioned room features satellite TV and a fridge. The private bathroom comes with shower facilities and toiletries. Rate: THB 580.00 ... THB 1360.00; select dates below to get current rates. 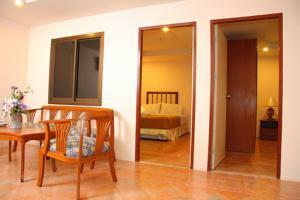 Fitted with tiled flooring and a seating area, this air-conditioned suite features satellite TV and a fridge. The private bathroom comes with shower facilities and toiletries. This spacious suite offers 2 bedrooms and a separate living area.